Casholot casino recently became irresponsive. Rumors say it was aquired by a new group, but we cannot confirm it. In any case, we do not recommend our visitors to play at this casino. There are plenty great sites out there, no reason to risk your money at one you cannot trust. Here is a list of our top 3 US brands. 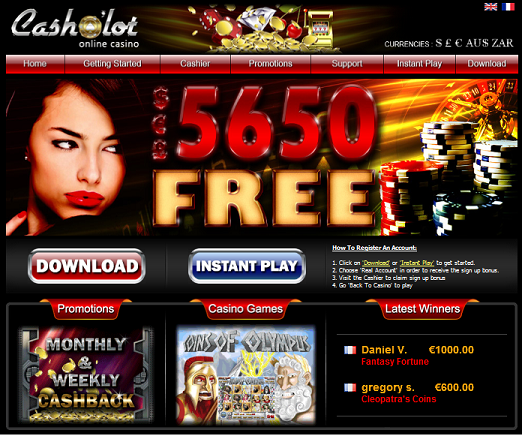 Casholot Casino (Cash’o’lot) is a Rival online casino, established in 2013. It is licensed in Curacao and sister to Tropica, Sahara Sands and few other Rival brands. New players can try Casholot Casino slots with a $/£/€/AUD 7 no deposit bonus. Besides the no deposit bonus, Casholot Casino offers a very unique welcome bonus packed. It starts with 100% bonus up to $/£/€/AUD 100 on your first deposit and goes up with each deposit you make until it reaches 1000% up to $/£/€/ 1000 on your 10th deposit. In total, on your first 10 deposits you can get a $/€/£ 5650 bonus. On top of that, you will get 3 free chips on the way: $/£/€ 100 after your first 2 deposits. $/£/€ 250 after your 6th deposit and $/£/€ 500 after your 10th deposit. Each bonus has different wagering requirements – make sure you are aware of them. Please notice that most of these bonus are slots only and they do have 2 special rules: 1) you have to play at least 7 different games. 2) The maximum bet per spin is 10% of the deposit amount. For example if you deposit $50, the max bet per spin is $5. Casholot Casino offers a great variety of online slot machines. From classic 3 reel such as Big Cash Win and to the sleek i-Slots games such as Reel Crime, Scary Rich and Hobos Hoard. The casino main focus is on slot players, but you can still enjoy all your favourite casino games. Blackjack, Video Poker, Roulette, Baccarat, Craps, Keno and Scratch Cards. You can play all the games by downloading Casholot Casino software or just by using the instant play version. Unless you play on Mac – in that case you need to use the instant play version. In the beginning of 2015 Casholot site was redesigned and reprogrammed. Before the change we’ve recommended to use only the download version. Now the situation is different, the site is responsive, fast and up to date. Very friendly and easy to use. The variety of games through the download version is slightly bigger, but with almost 200 games to choose from it’s hardly noticeable. Casholot Mobile casino look and design is quite unattractive, specifically the home page, but it is very friendly and easy to use. You have over 30 slots to choose from, including Rival famous i-Slots such as Silver Unicorn, Vintage Vegas, Leonardo’s Loot and more. Other games include blackjack, video poker, roulette and keno. The variety of deposit methods that Casholot Casino has to offer is rather limited, but it covers all the main deposit methods. The minimum deposit is $/£/€ 20. The maximum withdrawal is $/£/€ 4,000 per week. The withdrawals are processed within 3-5 days. Casholot Casino casino is 1 of 5 online casinos operated by Silverstone Overseas Ltd: Tropica, Gibson, Sahara Sands, Ricardo’s and finally Cash’o’lot. Some of the brands were dormant casinos that were acquired and re-launched by Silverstone Overseas company. All 5 brands earned a good reputation for being fair and reliable. Most important, they are one of the fastest US friendly casinos when it comes to paying winnings. One of fastest paying US friendly online casinos. One of best parts is the welcome bonus offer which starts with 100% bonus and goes up to 1000% on your 10th deposit. There are some special bonus terms that you need to pay attention to, but if you are a slot machine fan – Casholot Casino has a lot to offer.